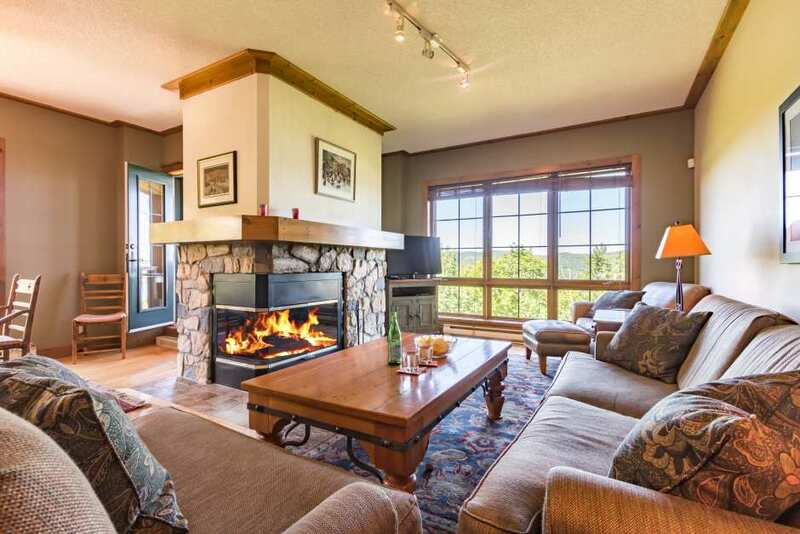 Great corner unit with many windows from which to admire the best view of Tremblant. Three bedrooms and two bathrooms in 1,530 sq. ft. of well-organized, bright and airy space. The kitchen is well-equipped and pleasant to spend time in while throwing together a quick bite or making a more elaborate meal. The large dining table is the perfect place to gather around to share a meal and the day’s adventures. You’ll love unwinding on one of the two comfy sofas, while a fire crackles in the stone fireplace. The spacious master suite offers a king-size bed and dressers, a private bathroom and a large covered balcony. In the two other bedrooms, one has a queen-size bed and the other has two singles. Plenty of space for everyone! Heated tiles,air conditioning, wireless high-speed internet and three TVs add to guests’comfort. A wonderful place to stay in any season!